I do like the beeeeeeeeeeeeeeeeees! 2nd class too! (although not exactly the same). 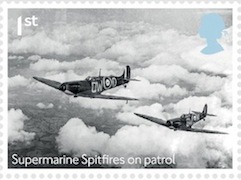 As for the Battle of Britain miniature cover, its alright, it blends with the concept of the actual event, the stamps are what I was expecting to be honest, so overall I quite like it. I wonder about the status of the "Bees" counter booklet. I have attempted to buy an example of it from 3 local post offices in different parts of the country - a suburban post office in Birmingham, the main post office in Stratford-upon-Avon and a suburban post office in Sheffield which has previously had a great track record for supplying almost everything connected with Royal Mail new issues. I failed to obtain the booklets in both the Birmingham and Stratford p.o.s and was told that they would not be supplied with them. The post lady in the Sheffield p.o. tried to order the booklets but was informed that she could not be supplied with them and that they were only obtainable from the Philatelic Bureau. If this generally is the case then I feel that these are not postage stamps with reasonable availability to the general public for use on mail. They are simply philatelic collectables of no real relevance to the postal service similar to the current status of "Post And Go" labels in Gibraltar or Stamperija-produced items in their "client" countries. If my experience of trying to obtain this booklet is the same as other peoples' experiences then I will not bother trying to obtain one to add to my collection but if others have found that these booklets actually are generally available then I will buy one after all even if it means buying it from the Philatelic Bureau. 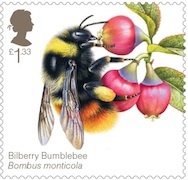 When I was in Dolgellau last week and mentioned the Bees booklet (I was looking for 12 x 1st and explained the different codes) I was told that the only mixed book they could remember having was the Sustainable Fish - and everybody remarked that there were only 4 stamps in it, until the two fish were pointed out. On the other hand, as you will see on the comment from Richard on the 'Secret' post, offices do get them. When a Mixed Content booklet is issued, that should be supplied to PO branches from Swindon on the next order until exhausted, when the supplies revert to the default. If another Mixed booklet is issued in time for the following order (as happened with the Design Classics series) then that will be supplied. Much depends on the frequency of ordering. I know one postmaster who hates the returns process so much that he puts in very big orders, ie he orders only a few times a year unless something runs out. It may be that, in the period between his orders, one or more Mixed Content booklets are issued and exhausted without him getting any. On his next quarterly order he may get the default again. Mixed Content books are books of 6 x 1st - they have the same barcode as 6 x 1st Machin booklets. Thus they could also be supplied to other outlets (supermarkets, newsagents, card shops), but I know that the major supermarkets resisted them for a long time, possibly because of problems such as Dolgellau described! There are two more books of 6 x 1st due in September, so it may well be that a particular office misses out on some of what has been issued. However, what you were told in your three offices is wrong, to my knowledge. As it happens a friend was looking at stock in a local crown office, and they had Bees. On their previously input order they added a footnote to say that they wanted Bees and they got them - whether this was by default or because they asked nobody knows. Thank you Ian. It seems that confusion reigns but at least, from what you write, some of the booklets are getting through to post office counters.